Whether you are just visiting Grandma for the day, heading on a road trip, or traveling by air, we have you covered! Table for Two's travel bag offers a custom fit to ensure protection. 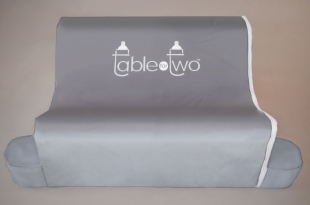 You can now comfortably carry Table for Two while keeping your hands free to carry your babies and everything else! The bag includes a carrying handle, a shoulder strap, and an ID pocket with ID card. Travel bag is made of a water-resistant, heavy-duty fabric that is easily wiped clean.